Membership in the International History, Philosophy and Science Teaching Group is open to all persons interested in the history, philosophy and social studies of science and science education. 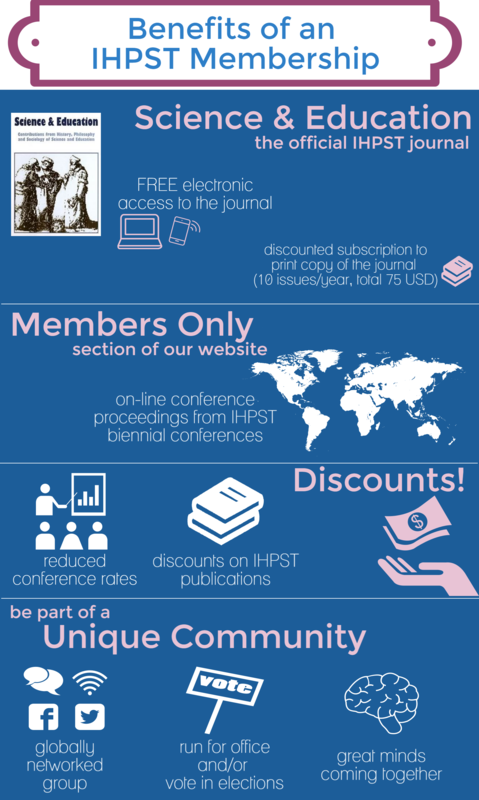 As of April 29, 2013, the IHPST Council instituted a two year membership policy. Memberships run based on the calendar year, beginning on January 1st and end on December 31st of the following year (ie: Jan. 1, 2015- Dec. 31, 2016) irrespective of the month you join. We have five membership categories: (1) Regular Members; (2) Student Members; (3) Teacher Members; (4) Retired Members; and (5) Members who reside in countries eligible for a reduced rate (see below). Individuals who fall into more than one category noted above may choose which category of membership they would prefer to become or renew their membership under. Regular Members are members who pay dues and do not fit the other categories. The Regular Membership dues rate in United States Dollars (USD) is $55 USD for two years. Regular members may stand as candidate for any elected office within IHPST (except Student and Teacher Members of the Council) and may vote in IHPST elections and on IHPST by-law changes. Teacher Members are individuals currently employed as teachers at the pre-kindergarten through high school level who pay annual dues at the teacher rate. Teacher Membership dues rate: USD $55 for two years. Teacher members may stand as candidate for any elected office within IHPST (except Student Member of the Council) and may vote in IHPST elections and on IHPST by-law changes. Student Members are individuals registered in a program of study in any field relevant to the purposes of IHPST who pay annual dues at the student rate. In order to qualify for this rate, the member must be a full time student in either an undergraduate or graduate program who has not yet earned a terminal degree for his/her current program of study (B.A. or B.S. ; Ph.D. or Ed.D.). Individuals seeking to become student members must provide the name and contact information of a faculty member who can confirm the individual’s status as a student. Student Membership dues rate: USD $25 for two years. Student members may stand as candidate for Student Member of the Council within IHPST and may vote in IHPST elections and on IHPST by-law changes. Retired Members are individuals who are fully retired and pay the annual dues set for this category. Retired members must be either 65+ years old OR identified as have emeritus faculty status at an accredited institution. Retired Membership dues rate: USD $25 for two years. Retired members may stand as candidate for any elected office within IHPST (except Student and Teacher Members of the Council) and may vote in IHPST elections and on IHPST by-law changes. Reduced Rate Members (discounts for members residing in eligible countries) are individuals residing in countries with a United Nations Development Programme (UNDP) Human Development Index (HDI) of .700 and below are eligible for membership and conference fees at the retired member rate. Reduced Rate Members may stand as candidate for any elected office within IHPST for which they are eligible and may vote in IHPST elections and on IHPST by-law changes. For additional information on UNDP rankings, please refer to http://hdr.undp.org/en/composite/HDI.